Don't forget to leave a comment so you, too, can be entered to win a copy of this book! I picked up Sushi for One? for a light vacation read, and it did not disappoint. From the first page, I was hooked primarily because of the strong writing and fantastic characters. I could so relate to Lex Saki, the heroine. Lex Saki’s family is big, nosy, and marriage-minded. And with one cousin’s fast-approaching wedding date and a substantial push from her Grandma, Lex suddenly finds herself on a quest she doesn’t want: she needs a boyfriend in four months. If Lex doesn’t, then her grandmother will pull funding of the girl’s volleyball team that Lex coaches. The boyfriend has to be convincing enough to make Grandma believe they are serious, while allowing Lex to maintain her freedom. Lex is desperate to prevent the funding from being pulled. How hard can it be to find a boyfriend anyway? Forget about the pain from an old event she’s trying to avoid. Or the fact she’s trying to find a job that fulfills her. Oh, and there’s the matter of where to live. 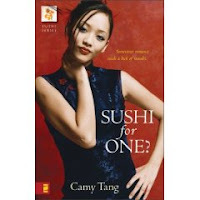 Camy writes about a character many of us can relate to. She’s not a model, but athletic. She cares about her family, but fights being smothered by them. Then there are her strong relationships with her cousins that swing up and down until Lex begins to feel like she’s on a roller-coaster. In sum, her life is chaos. Just reading about her life made mine seem a bit more sane. The book is a romance with chic lit trimmings. Camy tells the story in third person, so the reader gets to go inside several characters’ heads. The book has a fun, sassy attitude that even carries over to the glossary of Asian words. Camy’s writing is also very physical and active. The characters don’t merely move. They grip another’s arm like talons. Tugged, coughed, freaked, flinched. Camy writes with strong verbs that convey exactly what the characters are doing and thinking. And often she has fresh ways of amplifying the characters’ emotions. The romance is rife with boyfriends and prospects that are thrown at her from all sides. Her Ephesians list of traits that make a good boyfriend grows as the dates continue. And while Lex is willing to do what it takes to keep Grandma’s funding, there is only one guy who attracts her. She made a bad first, second and third impression, and his wasn't so great either. The fireworks between those two are wonderful! I honestly didn’t know if I’d like Asian chic lit, but I have to tell you, I can’t wait to read the next book! Camy is a talented addition to the Zondervan line. Thanks so much for the review, Cara! Please count me in to win a copy of the book, thanks!